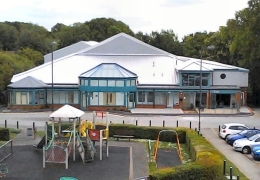 Hook’s two village halls are the Elizabeth Hall in Raven Road and Hook Community Centre in Ravenscroft and are managed by Hook Village Halls Charitable Association. Hook Community Centre, which stands at one end of Hartletts Park, was originally opened in 1989. It re-opened in May 2015 following a major refurbishment. The Base Youth Centre, Hook Village Nursery and Hook Community Squash Club have dedicated premises in the building and there are three rooms of various sizes available for hire. The centre also houses a café. Hook Parish Council‘s office is also situated at the Community Centre. 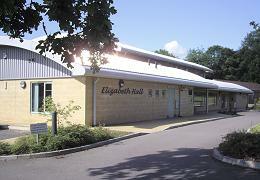 The Elizabeth Hall is situated in Raven Road. It was opened in 2008 and has a large hall with stage facilities and three smaller rooms. More information about hiring either the Elizabeth Hall or the Community Centre can be obtained from Hook Village Halls Charitable Association. There are two recreation areas which cater for sporting activities: Hartletts Park, and King George V Playing Fields, plus a Bowling Green in Bowling Green Drive. Hartletts Park has two football pitches (one full size). The tennis courts and multicourt are available for use free of charge, with no booking required – just turn up and play. There is also a childrens’ playgound, an outdoor gym and skateboard ramps in the park. The King George V Playing Fields are on the common close to the A287, near The Hogget pub (formerly the Dorchester Arms). 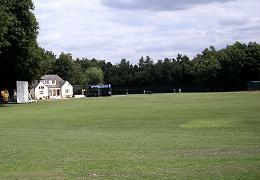 There are facilities for cricket, football and tennis. All enquiries about any of these areas should be addressed in the first instance to the Parish Council Office. 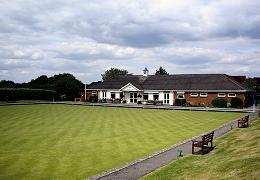 Enquiries concerning the Bowling Green should be addressed to Hook Bowling Club. In addition, Bassetts Mead is an area of public open space adjoining the River Whitewater, to the east of Hook. It is owned by Hook Parish Council and managed by the Hampshire Wildlife Trust. The Hook Allotments are situated off the Reading Road, to the north of Hook. 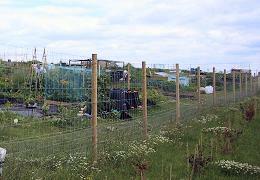 They are owned and managed by the Hook Allotment Association. Note: Pages linked to from this site are the property of their individual owners. Hook Parish Council accepts no responsibility for statements made and opinions expressed in such pages.